My most recent road test was of the Scion iA,, the new-for-2015 compact that is essentially a Mazda2 (the Mazda2 is not sold in America). Scion is the division of Toyota that has marketed affordable smaller cars since 2002 with the goal of selling them to millennials. The i in its name stands of individualism and the A is emblematic of accommodation, referencing the ample luggage space in the trunk, which is 13.5 cubic feet. Interior space is 85.9 cubic feet (five people). I drove my test iA (2016) to Pirate Radio in Greeley, which is 104.7 on the FM dial. The DJ’s at the Pirate, George Gray and Matt Arguello, looked over the Scion and sat inside for a feel for the car. Their impression was favorable, and they commented that the vehicle was the least expensive of any offering that I had showed to them. We talked about the car on “Stu’s Reviews” at 7:30 am on December 11th, and the positive remarks were voiced on-air that morning. The M.S.R.P. of my Scion was $17,570.00, including freight of $770.00. Standard equipment on the car included an air conditioner, AM/FM radio with 6 speakers, 7″ audio touchscreen display, tilt/telescope steering column, push button starter, keyless entry, Bluetooth connectivity, backup camera, cruise control, and power windows/locks. Up front were black cloth bucket seats and the rear 60/40 bench seat folded flat for additional cargo capacity. 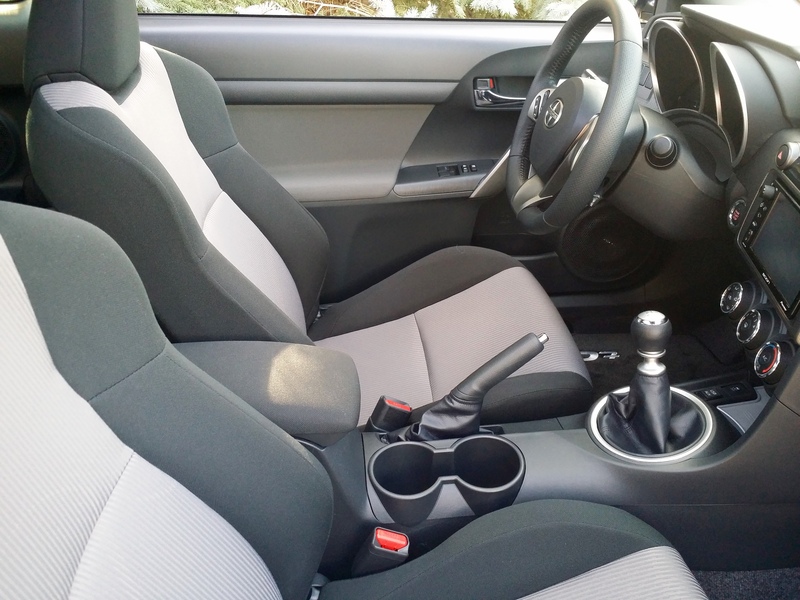 I drove the Scion iA for a week and the performance was satisfactory in all respects. The power for the car is supplied by a 4-cylinder, 1.5 liter, dual overhead cam, 16-valve engine. Horsepower is 106 @ 6,000 rpm and torque rating is 103 lb. ft. @ 4,000 rpm. EPA ratings have been computed at 42 mpg-highway, 33 mpg-city, and 37 mpg-combined, and my result was 40.6 mpg for the week. Fuel tank capacity is 11.6 gallons, so range is quite good. Zero to 60 acceleration for the iA is reportedly between 8 and 9 seconds. With Mazda putting together the styling of the iA, you can expect a good-looking car, which the iA is. I have my reservations about the grill, but must say that onlookers at my radio station visit seemed OK with it. It is not a hatchback, just a conventional sedan with trunk, and looks pretty nice with the Pulse red paint and ten spoke alloy wheels (not plastic hub caps). The car is 171.1″ long and weighs 2,400 lbs. 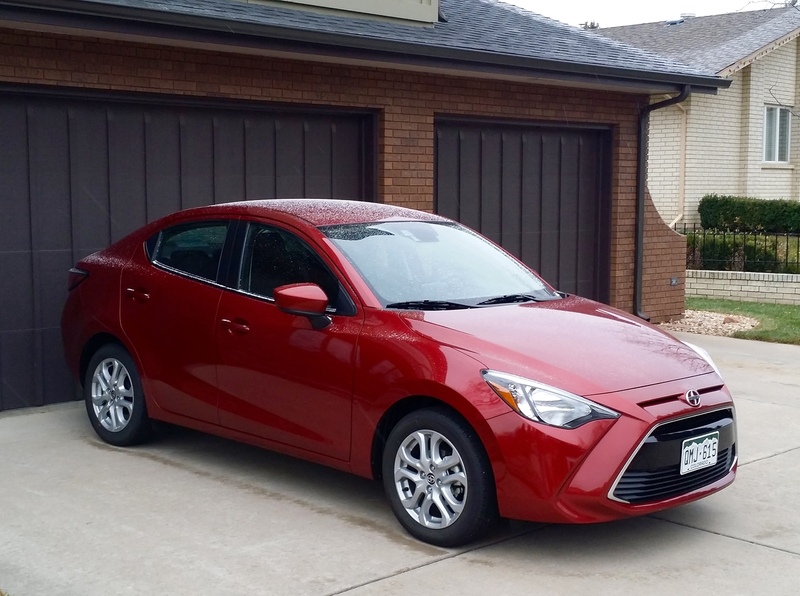 The Scion iA is good, basic, inexpensive transportation and I enjoyed having it in my possession for a week. An entry-level automobile shopper would be doing themselves a favor dropping by the dealership to test drive the iA. The first Mazda3 that could be purchased was the 2004 model, and the 2016 recently was introduced in a third generation configuration. 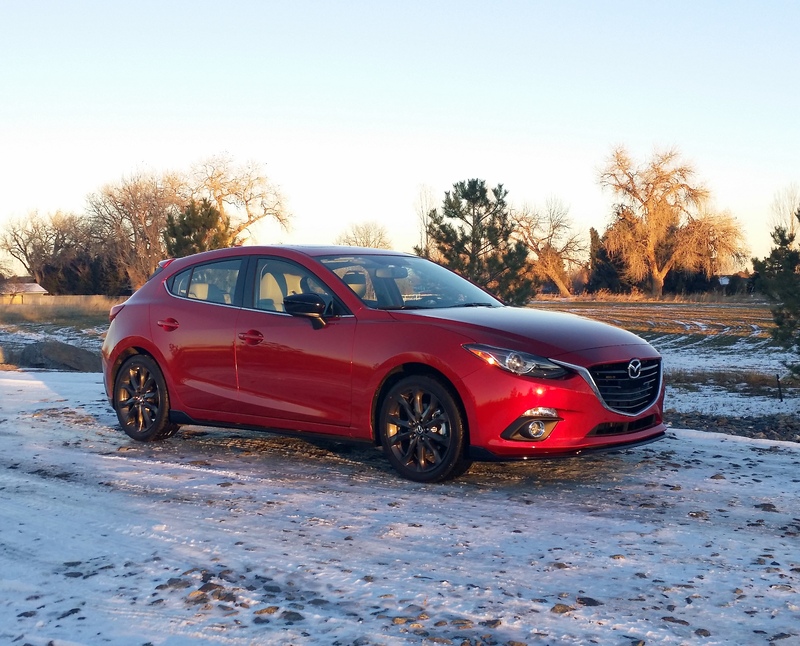 The Mazda3 was loaned to me for testing recently by Greeley Mazda, and it came in Soul red metallic paint with a black and almond leather interior. At the same time as the Mazda arrived, the January, 2016 issue of Car and Driver magazine arrived, and in it was the Mazda3 designated as a “10 Best Cars for 2016” selection. 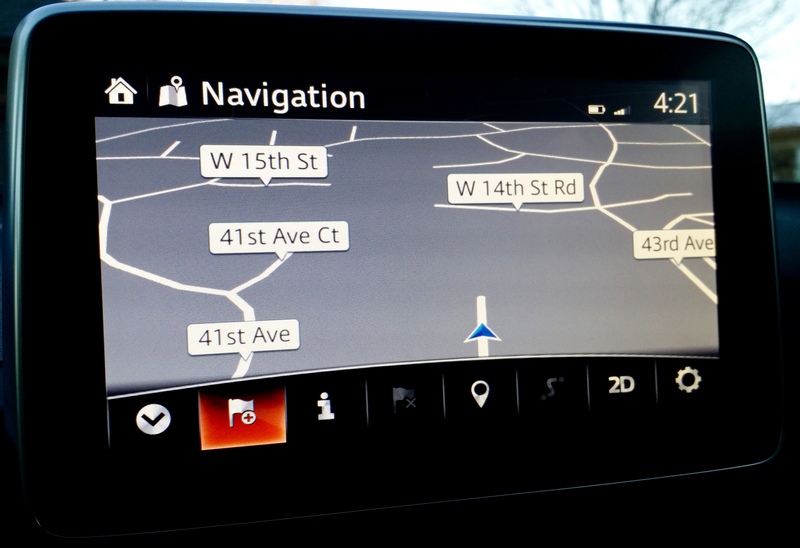 The test car that I received was the top-of-the-line Grand Touring S edition with an M.S.R.P. of $30,270.00. The base price was $26,495.00, and to it was added several options that totaled $2,955.00, most notable among them being an appearance package for $1,750.00. In the package was a grouping of spoilers and side sill extenders that actually added nicely to the appearance of the car. As a Grand Touring Mazda3, my loaner had a moon roof, heated front seats, power driver seat, navigation/rear camera setup with 7” touch screen, and a Bose 9-speaker surround sound stereo. 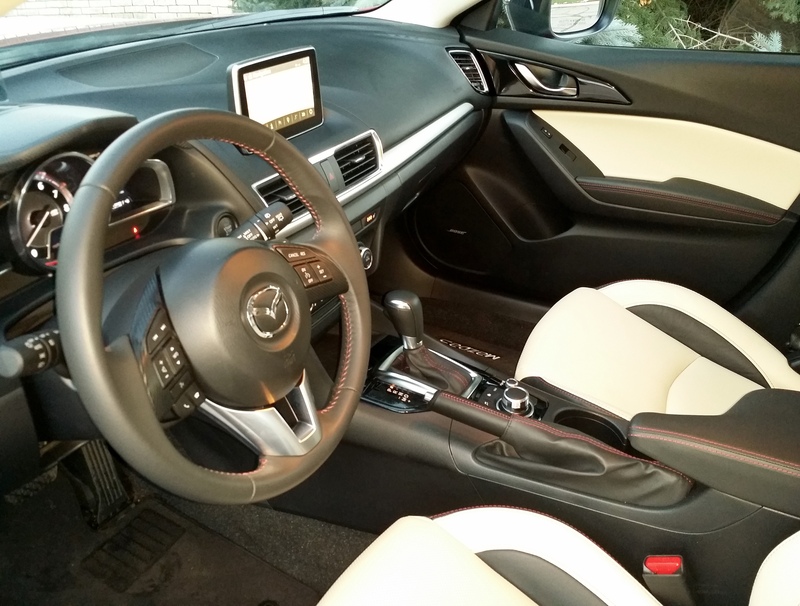 Additionally, the Mazda was equipped with XM radio, a console-mounted command control for the infotainment system, blind spot monitor, proximity keyless entry, and power windows/locks/outside mirrors. A genuine “hand brake” and push button (plus remote) starter, always positives for me, were on hand in the attractive Mazda interior. Also, the Grand Touring model features auto on/off bi-xenon adaptive headlights, LED combination taillights, LED daytime running lights, rain-sensing windshield wipers, auto-dimming rearview mirror with Homelink®, and perforated leather-trimmed seats. Power for the Mazda3 S is supplied by a 2.5 liter, four-cylinder, 184 horsepower (@ 5,700 rpm), 185 lb. ft. torque rating (@3,250 rpm) engine coupled to a six-speed automatic transmission with floor shift and paddles on the steering column. Reportedly, zero to 60 timing for the 3 is 7.4 seconds. Fuel economy ratings are 27/city – 37/highway, and 31/combined miles per gallon. Mazda equips this drive train with what is called SkyActiv technology, a combination, among other things, of 13 to 1 compression ratio and direct, multi-hole fuel injectors. Therefore the EPA highway readings are excellent, with my observation coming in at above the 31 mpg combined number. Styling of the Mazda3 Grand Touring S, introduced in 2014, features a longer hood and elevated trunk lid with aerodynamic spoiler attached. All four windows roll down out of sight, and the windshield has an impressive rake to it. Wheels are ten-spoke dark gray alloys fitted with P215/45R18 all-season radials, and the new grill has a more menacing, blacked-out customized look. I gave high marks for the ride, handling, and guidance of the car, and adjusting the sound system and navigation is easy with the right hand on the command control arrangement. The Mazda3’s handling is improved by virtue of the electric-assist power steering, MacPherson strut front suspension and multi-link rear suspension (a rarity in this class). The car is 180.3” in overall length, with a wheelbase of 106.3” and weight of 2,848 lbs. The fuel tank holds 13.2 gallons and the trunk holds 12.4 cubic feet. I liked the 2016 Mazda3 five-door hatchback, and could anticipate recommending a purchase to a prospective compact hatchback shopper. And the new Car and Driver magazine editors agree with me. Scion automobiles are a product of Toyota (the Scion name means descendant of a family or heir), and were developed for the American market starting in 2002. Last month I tested a Scion tC 3-door lift back that was delivered to me by Rocky Mountain Redline out of Dacono, Colorado. 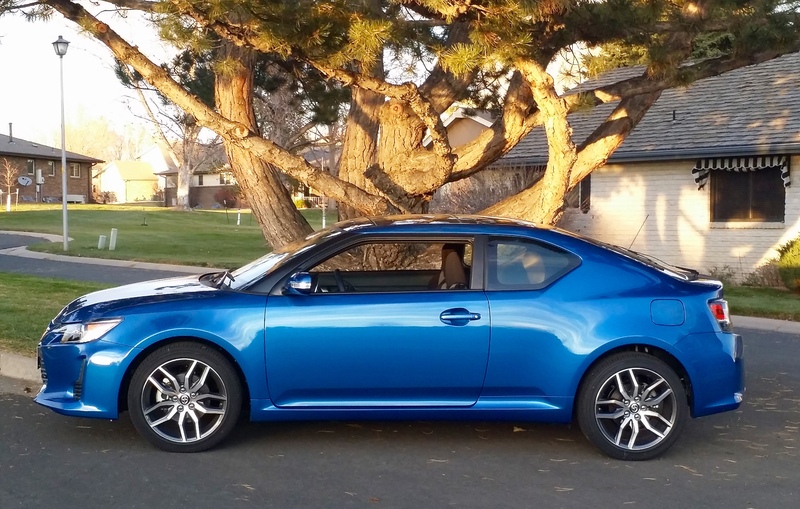 Originally, the Scion lineup included the xA hatchback and xB wagon, and in 2004 they introduced the compact tC sports coupe like I drove, and the tC is now in its thirteenth year of production. The paint was Blue Streak metallic blue, with black cloth bucket seats and five passenger seating. It is an attractive sport coupe with extensive re-styling that took place two years ago. My test tC had a 106.3” wheelbase and a chassis that was derived from the European-market Avensis sedan as well as the Lexus HS-250h. Acceleration (0-60 in 7.5 sec.) is provided by the 2.5 liter, 4 cylinder, DOHC, dual variable valve-timed, in-line powerplant. Horsepower is 179 and the torque comes in at 171 ft.-lbs. Fuel economy of the tC with the 6-speed manual transmission computes at 23 mpg city, 31 mpg highway, and 23 mpg combined, with a 14.5 gallon fuel tank. The front MacPherson strut and double-wishbone rear suspension gave me a sporty ride and smooth handling, and visibility and road noise are fine for a twenty-thousand dollar automobile. Speaking of which, M.S.R.P. of the Scion was precisely $20,180.00, including all standard equipment and freight of $795.00. Standard equipment included a glass tilt/slide moon roof, 8-speaker stereo with Bluetooth connectivity, pushbutton starter, power windows/locks, tilt/telescope steering column, remote keyless entry, and cruise control. The glass that runs the entire span of the roof presents a striking appearance, as it is a hatchback design without a package tray in the rear (you can peek in the 14.7 cubic ft. cargo area from outside). Turning radius on the Scion is 18.7 ft., and the length is 176.6 in., making the handling and parking of this vehicle quite manageable. Whenever I took the tC around the community, a lot of looks and questions were presented to me because of the car’s top-notch styling. Males seemed to pay particular attention, which is good for Toyota because they are striving for 60% male purchasers. 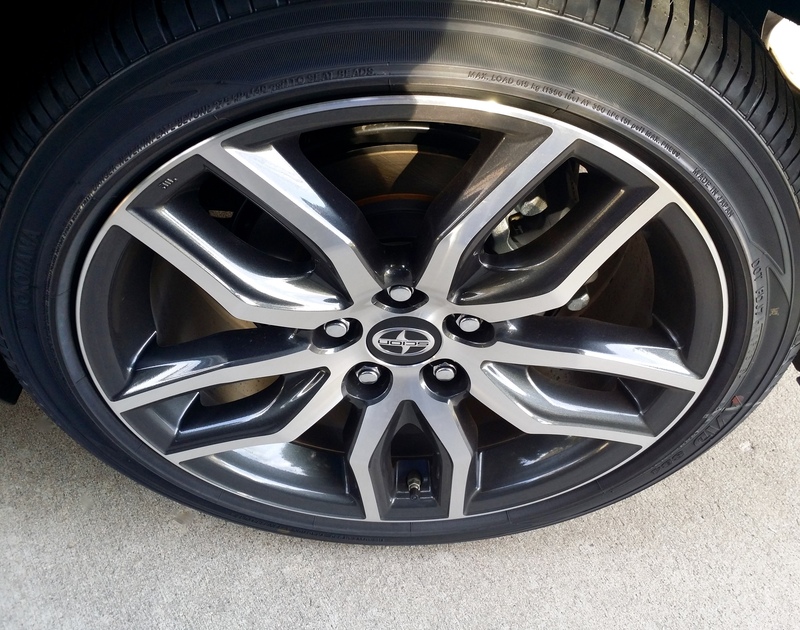 The tC features 18-inch ten-spoke alloy wheels surrounded with 225/45R18 Yokohama all season radials. Looks are enhanced with the bulging rear wheel-wells and the front grill that has a Lexus look to it, and on balance, the car is a solid alternative for the compact sporty car shopper.